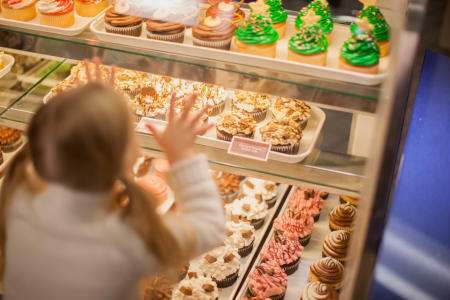 From cupcakes, cake, and cookies to Pennsylvania pies, pastries, and muffins it’s always time for something sweet at our region’s bakeries. You’ll be tempted to grab a few confections to go, perfect for munchies on your car trip home! Award-winning Hershey bakery, Desserts, Etc., welcomes locals and visitors alike to their rich array of gourmet baked goods infused with fresh, seasonal ingredients and endless creative inspiration. It’s okay if it takes you a while to decide what to order. Their delectable options include sweets like cookies, giant cupcakes, brownies, cream cheese stuffed muffins, cannolis and fruit tarts, alongside savory selections such as quiche, everything bagels, and sandwiches. They also offer a flourless selection of cookies, muffins, and cupcakes for gluten-free guests to enjoy. As an out-of-towner, you’re probably not in the market for a custom cake, but their impressive and mouthwatering gallery of confectionary creations might change your mind. Desserts Etc. is located on aptly named Chocolate Ave. across the street from The Hershey Pantry where you can find the best breakfast in Central PA. The chocolate at Hershey’s Chocolate World Attraction doesn’t always come in a wrapper. Locals know where to get incredible desserts baked fresh daily using none other than Hershey’s Chocolate as inspiration and a key ingredient. You’ll want to Instagram their giant cupcakes before you take a bite. Their fan-favorite flavors include Hershey’s Special Dark, Reese’s Peanut Butter Cup, and holiday and seasonal options like Halloween and Christmas. Like their oversized cupcakes, they also serve BIG cookies like Reese’s Pieces or s’mores inspired selections with marshmallows and chocolate chunks on top. Each day at the Bakery at Hershey&apos;s Chocolate World brings a new selection of sweets, so don’t be shy about ordering a box full to take back to your hotel room. Life is just as sweet in Harrisburg at this bustling food mecca in Midtown. The Broad Street Market houses several delicious pastry professionals, like Evanilla and their freshly made cake donuts that have been known to sell out…daily! Their specialty toppings are outside the box, swapping basic glazed and sugared for flavors like Lavender Caramel, Strawberry Rhubarb, and Pretzel Pineapple. Stop by whenever you’re in town to try a new treat because their flavors change each weekend. Raising the Bar bakery occupies a corner of the Stone Building and bakes fresh bread, baguettes, muffins, savory tarts, dessert bars, cookies, and more. If you’re already worried about too many carbs, know that they use natural ingredients at their bakery. If you’ve never tried a crêpe, you don’t know what you’re missing. At Bon Appetit Crêperie, choose between sweet (fresh strawberries, bananas, Nutella, chocolate drizzle, and whipped cream) or savory (like Chicken Mediterranean with grilled chicken, chickpeas, tomatoes, red onions, scallions, mint, parsley, cilantro with homemade sesame sauce) and watch them fill its thin pancake walls to hold in all the delicious fillings you can imagine. With so much fresh-baked goodness, we haven’t even mentioned the Pennsylvania Dutch delicacies like soft pretzels, pecan pie, shoo-fly pie, and apple dumplings available from Amish and Mennonite vendors. It’s important to note that the Broad Street Market is only open Thursdays and Fridays from 7 AM – 6 PM and Saturdays from 7 AM – 4 PM, but it’s well worth the visit! Marked by a sweet and inviting pink and vanilla façade, Anna Rose Bakery is downtown Harrisburg’s destination for fresh muffins, soft cookies, adorable cupcakes, and classic pastries like brownies, bars, and macaroons. 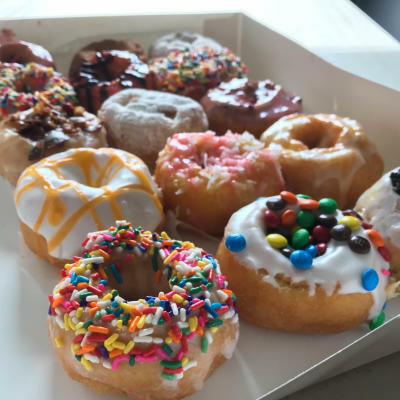 Their made-to-order cake donuts take the…cake, with their playful topping options like Fruity Pebbles, Cinnamon Toast Crunch, Cocoa Krispies, and bacon! Get your peanut butter fix with a huge Nutter Butter cookie sandwich or try a pecan bar that tastes just like the pie. Don’t forget to pair your treat with a cup of hot or iced coffee, a frappe, or a smoothie. But this unassuming bakery has a hidden secret – a good secret! At the back of the bakery, there’s a hidden lounge, 205 Speakeasy, accessible from the bakery’s phone booth for those who possess the secret code. Amidst the fresh produce and bushels of u-pick seasonal fruits at Strites&apos; Orchard & Bakery is a delicious selection of pies and Pennsylvania Dutch pastries available every day, year-round. These pies are made from fresh sliced fruits, then flash frozen to lock in the sweet flavors until it&apos;s ready for baking. When you want a Peach pie in February or a Pumpkin pie in July, you can take home a frozen delight to enjoy anytime. The Very Berry pie packs in plump blackberries, strawberries, red raspberries and blueberries, and their Apple Caramel Nut is a delicious fall selection, served best à la mode or after Thanksgiving dinner. While you&apos;re making your selection from a list of 20+ pie flavors, nibble on some freshly baked apple cider donuts, whoopie pies, sticky buns, muffins, cookies, and seasonal sweet treats! While you’re here, there’s no way we’d let you skip dessert!